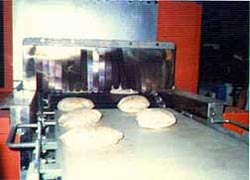 Products Line ['Arabic Bread' Line] | OSHIKIRI MACHINERY LTD.
Dough sheeting by multiple tiers type Teflon roller minimizes damages to dough, keeps freshness and provides soft quality products. By baking dough at high temperature (more than 500 deg. 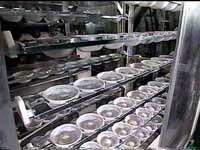 centigrade) short time (45 seconds), just like home-made, excellent products are created. Oven temperature is controlled proportionally, uniform baked-color and continuous baking are realized. Safe, reliable and hygienic. Solid, heavy-duty construction. Easy operation for temperature control with proportional control method. 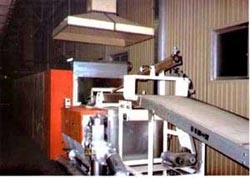 Indirect heating ensures consistent and even baking with continuous running.